While we all enjoy rain and it spells good news for nature as well, it is not so much fun when the rain enters into your home. Rain water seepage can cause more damage and prove more costly than you think. Aside from the obvious cost of repairs, which can escalate if the water seepage source isn't found and repaired, there's also the cost to your family's health from infections and respiratory ailments stemming from molds and bacteria formation. 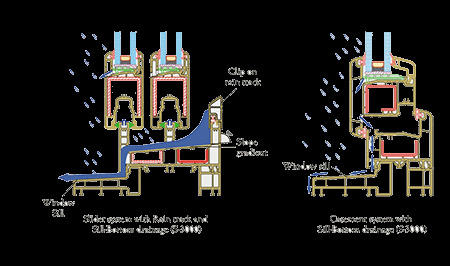 The same problem gets accentuated with traditional wooden windows and doors as they warp and resulting gaps invite rain. With aluminium windows and doors, if not installed properly, rainwater accumulates in the tracks and spills inside. Result:The airtight sealing of Fenesta and these special monsoon features work together to protect the invasion of rain into your home! Staying at home in monsoon becomes even more enjoyable, knowing your dear ones as well as all your precious belongings are protected.